A paper stencil is overlay on a piece of white cotton fabric, then a paste made up of lime and soya bean flour is applied with a blade over the stencil. The cloth is then put into the indigo dye trough for 20 mins then hang for oxidation for 30 mins (this process is to be repeated for 6-8 times). After drying the starch paste will be scraped off, under the paste will reveal the original white colour. For dyeing with a white background, 2 stencils would be used, one for the small pattern and second one for the background itself. 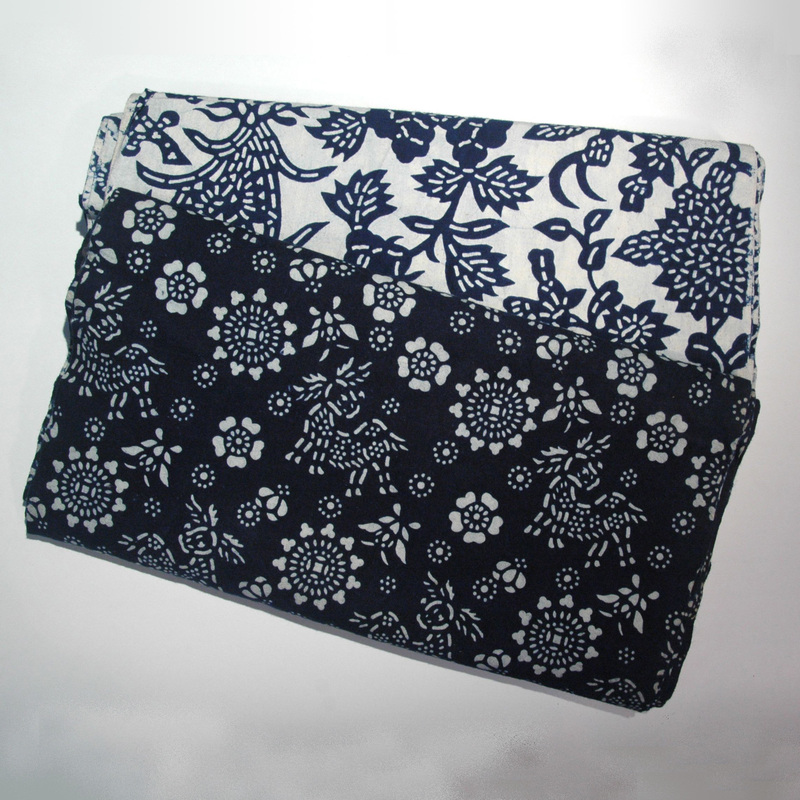 This Chinese indigo fabric uses a handwoven cotton fabric with natural indigo dye. Curtain with the same dyeing technique. I love this fabric and remember seeing it made in a village in Yunnan in 1982 when I was teaching in Kunming. I would like to buy some. How do I do this??? thank you so much for your interest! yes, you are right the fabric you saw in Yunnan is also an indigo dye fabric, they usually come in a width of 915mm (36 inches) and with the pattern on a single side of the fabric. 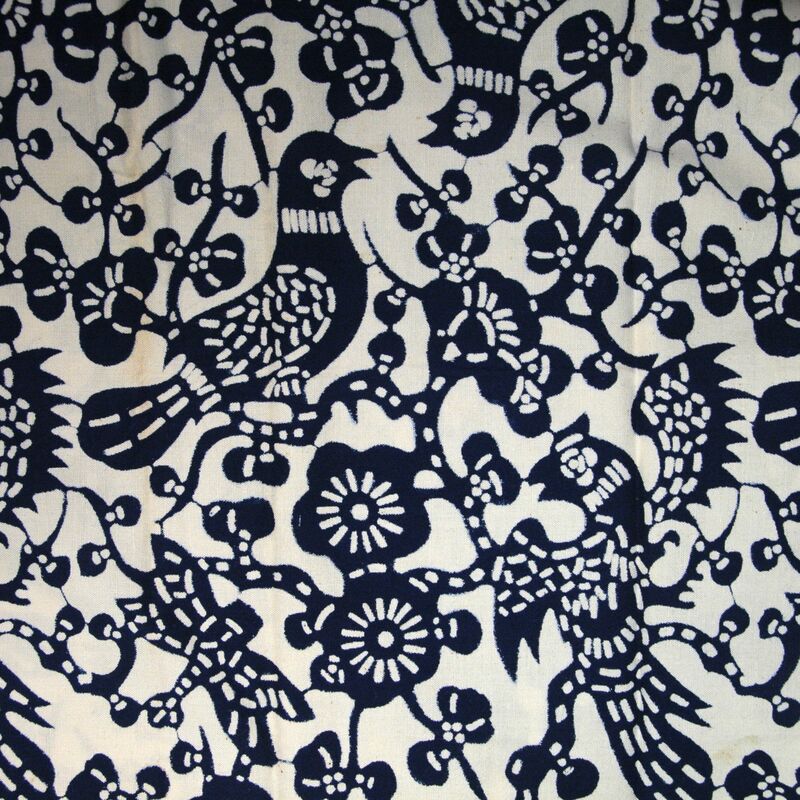 the price for “bird and plum blossom” fabric is HKD$50 (app. USD$7) per meter (1 yard) but unfortunately the “deer and plum” fabric is sold out.